Federal government applications evaluated by a human resources specialists. They will review your responses to the User Information, Core Questions, and Vacancy Questions. The job specific questions will relate to the knowledge, skills and abilities required of the position. Many applications are “thrown out” because of a lack of KSAs addressed by the applicant. IMPORTANT NOTE: ALL federal positions are advertised on www.usajobs.gov. DON’T be fooled by “other” websites that promise to advertise federal jobs for a “small cost.” Many of these “other” websites charge applicants to view federal positions and merely re-route the job links, but rest assure that these “other” websites are “pulling” information from www.usajobs.gov to get information about advertised federal positions. • Knowledge of the laws and regulations governing the realty program and the ability to use sound professional judgment to resolve conflicts with other resources. • Ability to evaluate and process realty applications and proposals and conduct compliance examinations on authorized actions. This means if your resume does not “match” the required KSAs within the advertised job announcement, the agency may manually lower your application score. Federal applications are scored from 0 points to 100 points. Your goal is to receive as many points as possible. Human resources specialists review applications with the highest scores first. Overall, KSAs are important and you will be evaluated based the information submitted to the job announcement. The key to writing government KSAs is to put the EXACT KSAs which are found in the job announcement within your resume or application WORD-FOR-WORD. Then go into detail about how your qualifications meet the KSAs. There are many benefits to applying and earning a government position. In this economy people are looking for job stability and benefits. The government has job security, benefits and more. In this economy, the government sector is hiring all types of positions. Many government agencies are still receiving stimulus money to create new jobs in all career fields. Government agencies are having problems finding the people to apply for the positions. That’s right, agencies are having problems finding people, because the public isn’t applying for government jobs as they did in the past. There are positions that need to be filled such as: Grounds Keepers, Administration Assistants, Administrative Secretaries, Engineers, Forest Rangers, Information Technicians, Clerks, Legal Assistants and the list goes on and on and on and on. There are some keys factors to completing government job applications. First of all, you need to create or update a personal profile on the main free government website: www.usajobs.gov. This is a “free” website that all government jobs are posted on, no matter what government department it is. There are a ton of scams that “say” they need a payment in order for you to gain access to federal positions. This is false! It is completely FREE to search and apply for government jobs. Although, many federal agencies fill jobs using private sector personnel, USAJOBs allows applicants looking for specific positions to “searches” tailored to the seeking candidates needs. One of the main factors is to review “eligible and qualified” factors of a job announcement you want to apply for. This part can be a bit tricky; the key is to go to the “Who May Apply” and “Requirements” tab at the top of the job announcement. Review the information. There is where the details of “Who May Apply” for the position and what the “Requirements” are for the position. If you feel you meet the requirements move on to the next step and “Apply” for the position. Remember, when using USAJOBS your profile information is “attached” to your application when you submit it. Make sure to complete your USAJOBS profile before applying for any positions on USAJOBS. Supplemental documents are also “attached” to any application you submit via USAJOBS. Make sure that all your documents i.e. DD214, SF 50, unofficial transcripts, cover letter or training certifications are all attached to the document section of your profile. We all know that education is vital in today’s job market. The fact is education comes in all arrays of quality and may be obtain in a variety of ways. You don’t have to have a degree to be considered educated, but you do have to have proof that you completed an educational program for which you are claiming you acquired the knowledge from. During your interviews selecting officials may want to know: What courses you liked most while attending school? What courses did you like least? These questions are steered toward the selecting official finding out more about you and what types topics interests you. This could be a mode of examining your personality traits or rating your ability to be trained on the job you are interviewing for. The next possible question: Why did you choose your course of study? This question is geared toward the selecting official gaining a deeper understanding of your professional agenda. This question is asked with the intentions of understanding the applicant’s passion for the field. Be honest and be short. Don’t give a long answer; the selecting official doesn’t want to know your entire educational background, only what pertains to the position you are applying for. Keep it short and sweet unless asked additional questions. Examples of experiences with training programs should show what you learned and how you applied the knowledge. Selecting officials want to know if you prepared for the interview. Make sure to practice answering these questions on your own or with a friend. It is helpful to use an audio device for you to review and critique yourself. This will improve you interviewing skills. Training and education are core elements of the job force. Without training and education work experience will only get you so far. With training, education and experience you will practically be handed more opportunities than you will know what to do with. But, inflating education and training accomplishments on your resume will hurt you in the long run. Be honest and factual with what you have been trained on and what you need training in. Always include On the Job Training (OJT), this is as valuable as formal education. Interviewers will also ask you: What workshops, OJT or other training do you have? This is an open-ended question targeted toward learning more about ability to be trained. If you are human resources professional, they will want to know if you have been to any staffing or employee relations workshops. If you are information technology professional they will want to know if you have been to any fiber optic, customer service or trouble shooting workshops. If you haven’t been to any workshops or OJT, state that and also state your interest in developing your skills for the benefit of the company. The new job market wants to understand your ability to want to learn and grow as well has your past training background. One of the last questions you WILL be asked is: Do you have any skills that are not listed on your resume or in your application? This is a great opportunity for you to “talk yourself up.” This means that you have an opportunity to talk as much about you and your skills and how unique you are. This is your time to shine, so don’t put every single detail on your resume. Give yourself some “room” to talk about yourself. We all have had an interview at one time or another in our professional careers. Interviews are hard enough as it is with getting through the first cuts of other qualified applicants, now that you have the interview all set up there are some questions that will be asked of you during the interview. The key to an interview is not one single thing, yet many items that you will be evaluated on. Your work experience will be the first items up for “conversation” after the small talk with a selecting official. They will want to know: Why are you interested in the job? This isn’t a trick question; it’s a question the selecting official really wants to know. Are you looking for a career change? Are you looking for a new position because you were laid off? The key to answering this question is to be honest, don’t give your whole life story – but be honest. There are a series of questions that are often asked in conjunction with each other: Why did you leave you last job? What would your last employer say about you? Would your last employer re-hire you? And Give me an example of a situation where you had to make a decision? What was the situation? What was the decision? And what was the result? Now, these questions are called “character questions.” These are designed to “weed out” the real applicants from those whom have not been so honest during the interview. The best advice I can give is to be honest, have professional examples in mind before the interview and take your time answering the questions. You can ask the selecting official to re-state the questions, you can write the questions down and you have all the time in the world. REMEMBER: YOU are there because they saw something in your resume, phone interview or overall application that they liked. 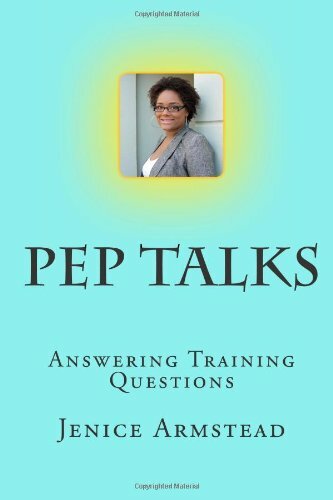 Pep Talks Vol 4 – Answering Training Questions provides the reader with an overview of different training questions an employer may ask the candidate. The Pep Talks Book Series is an introduction to a new way of interviewing and obtaining a job in today’s competitive market. The Pep Talks Book Series is all about giving the reader an advantage over their competitors when working toward the goal of gaining more knowledge and understanding in this new job market. This new job market is all about unconventional ways of obtaining knowledge while gaining the desired employment. The Pep Talks Book Series explains how the new Job market knowledge and understanding how to better improve the chances of being “individually recognized” as a professional are vital. The Pep Talks Book Series assists with building job confidence and self-esteem along with providing detailed examples for the reader to use for interviews. The Pep Talks Book Series are designed to assist the reader in planning, executing, and managing their own career and potential growth in their field of choice. Each section has an interactive “fill in the blank” area for guiding the reader with critical thinking activity examples to assist with brainstorming, and “Confidence Boosters” provide the reader with constant motivation for obtaining their “dream career.” The Pep Talks Book Series can serve the newly looking or the long-term job seeker with methods that will assist with the career search and provide motivation for future endeavors. The entire Pep Talks series is dedicated to the job seeker. Whether newly looked, or experience professional Pep Talks has something for everyone.